Hi! We’re Taylormade Acoustic Duo and you've reached our regional 'Leicestershire Wedding Music' page. We've played at hundreds of weddings, events and parties since we formed back in 2008, adding a stunning soundtrack with our 'live lounge' style acoustic arrangements. You can here our demos of these on our wedding music page. Whilst we cover the whole of the UK, there’s nothing quite like playing at weddings and events on our home turf as we are based in and around Leicestershire. Our hard work and dedication over the years has earned us a brilliant reputation and this reputation has enabled us to become preferred suppliers to many wedding venues around the Leicestershire area. We are proud to be highly recommended by the following venues: Kilworth House, Halstead House, Hothorpe Hall and The Woodlands, Quorn Country House Hotel, Mythe Barn and Normanton Park. We've also received hundreds of Glowing Feedback and Recommendations and a lot of our bookings come from word of mouth or engaged couples who have seen us performing live at their friends wedding or event. If you check out our Acoustic Duo Set List you'll see we cover a huge variety of tracks, from 50’s all the way to today’s hits, and we're constantly being asked to learn new ones. As part of our Wedding Music Packages, we offer to learn a track which is not already on our set list, free of charge. These can be for a beautiful Bride to walk down the aisle, or for an intimate First Dance to be performed live on the night at any of the gorgeous wedding venues we have here across Leicestershire. You'll also find a few of our personal favourites on that list too. From Journey to Prince, Eva Cassidy to Ed Sheeran, The Beatles to Beyonce, we've got it locked down. So why not grab yourself a cuppa, have a listen to our demos and watch our real life wedding videos. We really think you come along to one of our free of charge ‘Public Showcase Events' that we hold in Daventry too, and then make up your own mind. These Public Showcases are held every quarter and they are an invaluable opportunity to see Taylormade Acoustic Duo or 4 Piece Live Band in action, and to discuss your wedding music ideas with us in person, before you decide to book. We are extremely proud to offer these sessions as not very many acoustic duo's or wedding bands will offer this. You might also like to know that we have ‘Add-Ons’ of a brilliant 4 Piece Live Band and a Wedding DJ/Disco to keep the party going until the end of the night. You can book these aspects in addition to our Acoustic Duo with our sleek and stylish Wedding Music Packages. If you like what you’ve heard and would like to know more then please get in touch. 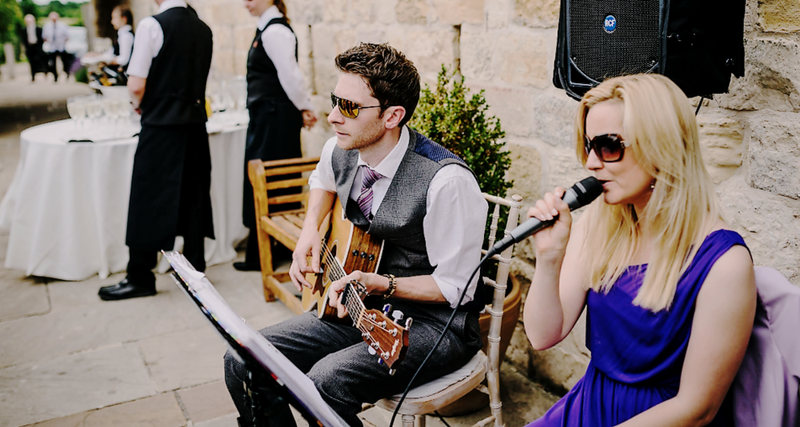 Whether for your Wedding Ceremony, Drinks Reception or Wedding Breakfast, or perhaps an early evening set to include a live performance of your First Dance, our Acoustic Duo brings a spark that only live music can bring. Or you might be planning a glamorous Office Function, Christmas or New Year’s Eve Party of a lifetime, then get in touch to check our availability and get a quote. We can’t wait to add a stunning soundtrack to your day!